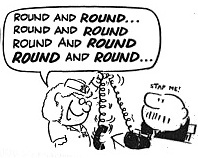 (Extract from strip 2585 published in the Evening Standard in July 1969 and in Bristow (1970). We never get to see Miss Pretty but thanks to the pursuit of her by the post-boy, we do get Bristow's description: a girl in a turquoise uniform with hair the colour of ripened wheat, dark fringed blue eyes and a rosebud mouth. The fashion for engaging outside contractors to clean office telephones was at its height in the 1960s. Perhaps in the days of shared telephones there was a case for having a device that could harbour germs regularly "sanitised", as they quaintly put it. Though why the regular office cleaners did not do this is hard to understand. Those of us with longer memories may recall the days when uniformed young women would wander round the office, a-spraying here and wiping there. But fashions change and who bothers to have their phones professionally cleaned these days? And have we all died of the plague? Well no, or I wouldn't be sitting writing these words, would I? 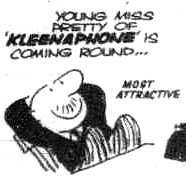 There is nobody now trading under the name "Kleenaphone" (as far as my cursory web search could tell), so an opportunity for some bright spark, but perhaps once there was.